We had a wonderful visit to Ghana. Though our time there was brief, we met some great people and had a lovely experience. We went to pasture with the herd of an important sheik near the city of Walewale. Out in the bush, we captured some great images and recorded plenty of footage. We walked with the herd, drank fresh milk, and slept under the trees with the sheik’s sons. Hopefully we’ll have that story online soon. Back from pasture, we spent a night at the sheik’s house and hit the road to Burkina Faso. We crossed the border without too much hassle, and rather than travel directly to the capital, Ouagadougou, we turned into the bush. We’d heard that southern Burkina is full of Fulani camps, so we set out to see for ourselves. 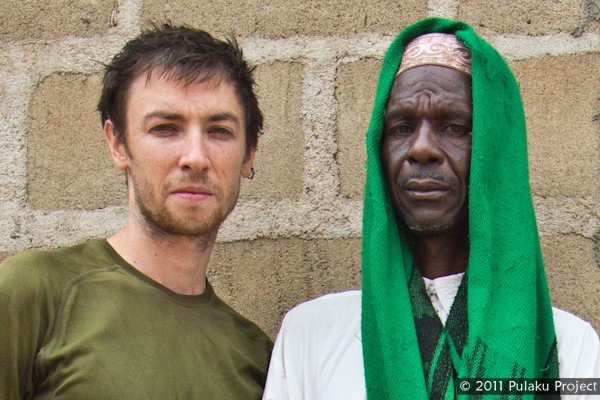 Sure enough, we rode through some truly wild bush with numerous Fulani settlements. We’d planned to reach the town of Bittou, where friends in Togo had given us some contacts. Unfortunately, as we unloaded Guida’s motorcycle, we discovered that his rear tire was flat. With the help of some friendly villagers, we fixed the flat tire, but the process cost us about an hour. By the time we reached Bittou, the sun was setting. We tried phoning our contacts in Bittou, but the calls went unanswered. 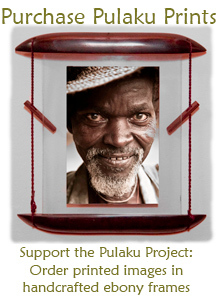 Near the market we met Abdoulaye Barry, a Fulani elder, and we explained our conundrum. He happily took us to the local Fulani leader, who said we should spend the night with Abdoulaye. We set up our mosquito nets outside his house, and he treated us to a dinner of jolof rice and sheep meat. Exhausted from our travels, we quickly fell asleep. 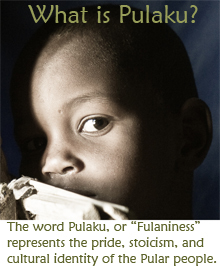 Little did we know, the Fulani in Bittou are victims of nasty discrimination. Some neighbors had noticed the arrival of Abdoulaye’s unusual visitors. Jealous of these foreigners who had presumably come to give Abdoulaye money and motorcycles, the neighbors reported these suspicious guests to the police. According to Abdoulaye, the local authorities are eager to impede any assistance to Bittou’s Fulani population. As we awoke, the police arrived and informed us that we were perpetrating an unauthorized visit to Bittou. I rubbed the sand out of my sleepy eyes as they loaded us into the police truck. Arriving at the station, they interrogated us and recorded all our vital information before sending us to see the chief of police. Mr. Chief informed us that we were in violation of the law for failing to announce our arrival in Bittou. We apologized as he explained that we had been “extremely impolite”. Hierarchy and social order are instrumental to African social order, and apparently “la politesse Africaine” is taken very seriously in Burkina Faso. Our apologies were insufficient, as he sent us to sit alongside the thieves and drunkards who’d been gathered outside the police station. An hour later, the chief called us back into the office. Having checked with his superiors, he claimed that it is forbidden to research Fulani culture without written authorization from the Minister of Culture (which is not true). He assured us that we’d be jailed if we continued our research in the area. Preferring to avoid imprisonment, we hit the road to Ouagadougou. Fortunately, we’ve got some good contacts here, and our arrival coincides with the beginning of the FESPACO international film festival. We certainly won’t be bored in Ouaga, but it’s a shame that we had to forgo our visits to the rich Fulani culture in Southern Burkina. Small price to pay to avoid visiting a Burkinabe prison. Did they rough you up at all?